After more than a year of negotiations, the compromised tax reform bill was signed into law. James Baker was a master of negotiation. Whether dealing with politicians on Capitol Hill or world leaders on the international stage, one of his strategies was to consider the costs and benefits when negotiating and making strategic decisions. In this activity, students will use a cost-benefit analysis tool when making real-life choices. This process will help students develop an understanding of the influence of positive and negative incentives on the decisions people make. Write on the board “cost-benefit analysis.” Ask students what they think cost-benefit analysis means. Explain that a cost-benefit analysis is the analysis of the cost effectiveness of different alternatives in order to see whether the benefits outweigh the costs. Explain that James Baker often used a cost-benefit analysis when negotiating. Show the following video clips. For each clip, discuss with students what kinds of costs and benefits Baker considered when making decisions. Master of Negotiation Video Clip #1 - Baker decided to announce George H.W. Bush’s campaign had run out of funds; this put in motion Ronald Reagan’s selection of Bush as a running mate. Baker knew that Ronald Reagan was going to receive the Republican nomination for president, and he weighed the costs of having Bush continue to campaign for the nomination against the benefits of Bush being the vice-presidential candidate. Master of Negotiation Video Clip #2 - When working with Edwin Meese, Baker weighed the costs of giving up some powers to Meese in order to gain more power with the president. Master of Negotiation Video Clip #3 - Baker worked with Democrats and Republicans to promote tax reform. 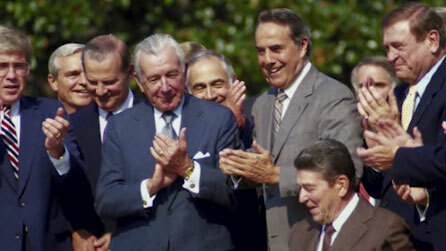 Master of Negotiation Video Clip #4 - Baker decides to change jobs from President Reagan’s chief of staff to the secretary of the treasury because of the toll the role of chief of staff was taking on Baker. Explain to students that they will use the cost-benefits strategy in order to make logical and rational decisions regarding a personal goal. Bring up on screen the Cost-Benefit Analysis activity. Explain to students that they will use the interactive to weigh costs and benefits for each of their decisions. The goal is to understand the influence of positive and negative incentives on their decisions and the decisions of others. Students complete the Cost-Benefit Analysis activity. Students write a reflective essay in which they answer the following question: “How can you use the cost-benefit analysis strategy to help you in making informed rational decisions?” Cite examples and details from the activity to support your answer. Use the Cost-Benefit Analysis activity to make real-life choices. D2.Eco.1.9-12 - Analyze how incentives influence choices that may result in policies with a range of costs and benefits for different groups. D2.Eco.2.9-12 - Use marginal benefits and marginal costs to construct an argument for or against an approach or solution to an economic issue. D2.Civ.11.9-12 - Evaluate multiple procedures for making governmental decisions at the local, state, national, and international levels in terms of the civic purposes achieved. D4.2.9-12 - Construct explanations using sound reasoning, correct sequence, examples, and details with significant and pertinent information and data, while acknowledging the strengths and weaknesses of the explanation given its purpose.